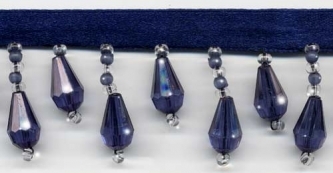 From our Beaded Drop Collection: Looking for the perfect Dark Navy Blue beaded trim? This is it! It is a beautiful and very rich shade of navy blue. This is a very popular color in decorating trends right now and hard to find in beaded fringe trim. The colors are translucent deep blue faceted teardrop beads with seed beads in crystal clear and dark blue. An absolutely beautiful beaded trim! This is a high quality, very full beaded fringe with exceptional detail and craftsmanship. The longer beaded stands are 1" long, not including the " rich navy satin ribbon. Perfectly stunning! Perfect for apparel or home decor.